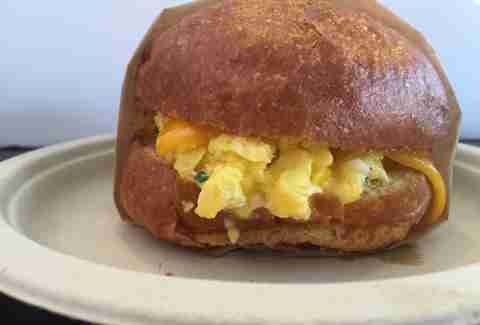 The New York Times recently called LA the best breakfast town in the US, and we all know that a) that’s true and b) that’s true partially because of our breakfast sandwiches, which is why we’re gonna tell you about the best breakfast sandwiches in LA. Thank us with bacon burps later. If you like your sandwiches with a side order of terrific ocean views, holla at the breakfast sandwich at Playa Provisions. 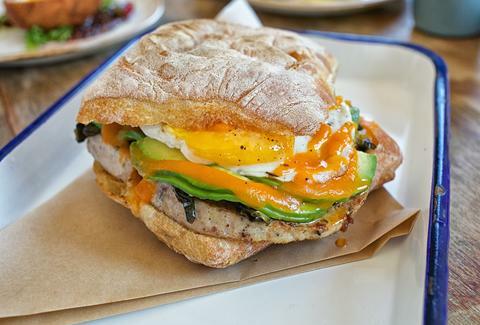 It’s loaded with an over-easy egg, turkey and bacon sausage, Gruyere, vinegar collards, avocado, and house-pickled habanero hot sauce (!). Oh yeah, they have ice cream too, so no need to wonder what you’re eating after the sandwich is done. Even non-vegans can agree that Locali’s Sir Nasty is a winner. 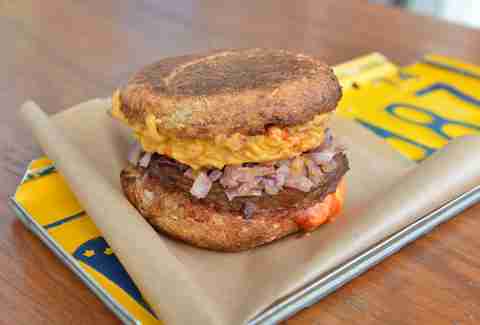 Almost like a vegan McGriddle, the Sir Nasty rocks a vegan sausage patty, vegan cheddar, vegan chipotle sauce, maple syrup, Sriracha, and red onion on a sprouted grain english muffin. Locali’s meat substitutes are insanely delicious even for carnivores, so put your doubts away and instead spend your time trying to figure out where to park. This miracle factory has an always-rotating specials menu which usually includes some variation of an outstanding breakfast sandwich, but the real prize is its OG always-on-the-menu sandwich. Sink your chompers into two fried eggs and cheddar cheese on a challah bun (and add bacon and avocado because you’re smart). This West Hollywood seafood haven, brought to you by the chef behind Providence, just rolled out some knockout brunch options, including the grand prize: its Nor’easter, a beautiful monstrosity of Nueske’s bacon, eggs, FRIED CLAM STRIPS, and tartar sauce on a homemade English muffin. If you know what’s “good” for you, you’re heading there right now. Yeah yeah yeah, you’ve heard Egglsut is great a million times Well the reason you’ve heard Eggslut is great a million times is because Eggslut is great, and it’s impossible to go wrong with any of its treasures, but you definitely want to try the Fairfax. 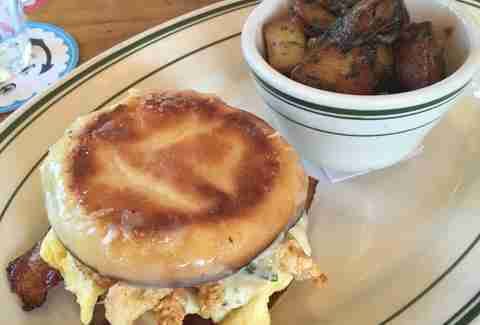 That is, you definitely want to try it only if you like the world’s fluffiest eggs, chives, cheddar, caramelized onions and Sriracha mayo on its signature warm brioche bun. 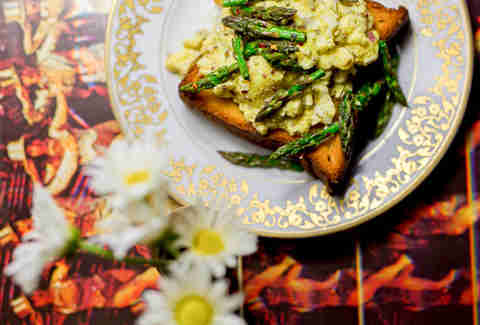 All right so this isn’t exaaaaaaaaactly a sandwich, but stay with us: this mom & pop sandwich shop names all its sandwiches after NPR hosts including the Alex Cohen: egg salad with dill, onions, capers, mustard seeds, and other goodies on a gigantic Texas toast-sized piece of brioche. Don’t run out the door just yet; you can only get this bad boy on Friday and Saturday mornings. So run out then. Neal Fraser’s one of LA’s most famous chefs for a reason, one of which is most definitely the special things BLD is doing in the kitchen. If you don’t believe us, get there immediately, to the fried egg sandwich, with thick cut-Neuske’s bacon, gruyére, and aioli on toasted sourdough. The bread is so tasty, it’s safe to assume that BLD stands for Big Life-changing Dough. Right? If the extreme trendiness of this place frightens you, take a deep breath and fight your fear; Sqirl is absolutely killer. Though the breakfast-centric cafe is famous for its rice bowls and jam, you’ll be the happiest Jerry or Jane on the block when you order the Famous Damos, which comes loaded with Surryano ham, chives, and scrambled eggs on a ciabatta roll. We know, we know, we keep telling you to go République. So, ya know, listen to us already because the spot’s whole menu is pure magic, including its breakfast & brunch. 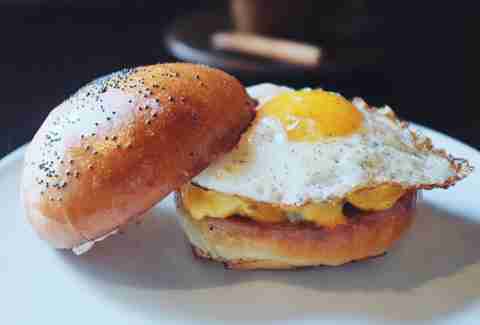 On it, you’ll see its breakfast sandwich, with fried egg, pork belly sausage, and American cheese. Bingo. 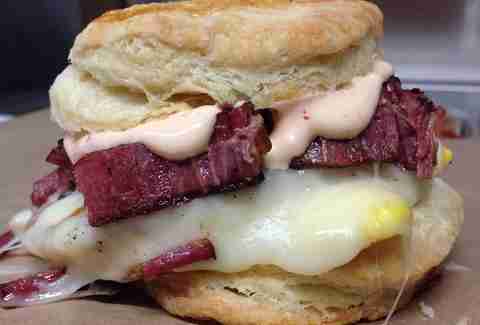 D3 is brand spankin’ new, and they’ve got a gorgeous selection of housemade biscuit breakfast sandwiches. In a deli mood? Hit the one with egg, corned beef, and jack. In a Mexican mood? 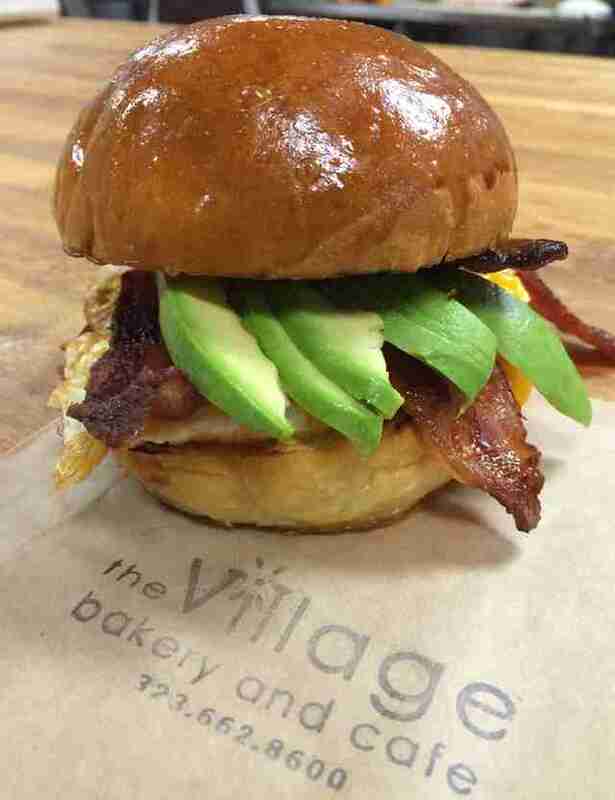 Hit the one with egg, chorizo, avocado, and Jack. In a veggie mood? Hit the one with egg, tomato, zucchini, and avocado. With so many tasty choices, you’ll feel like the world is your biscuit. Gjelina’s more casual and accessible offshoot is doin’ it up in Venice with upscale breakfast treats, like daily toast options and three different breakfast sandwiches. We love the GTA (fried egg, braised kale, melted Gruyere, bacon, and hot sauce on an English muffin), but also pretty great are the Turkey Egg (fried egg, sliced turkey, rapini pesto, and fontina on pain de mie), and the Bialy Egg (fried egg, arugula, Harissa ketchup, and Gruyere). Or go for ultimate greatness and order all three. Nope, we’re not ready to shut up about Locol yet. Beyond being the single most ambitious opening of the year, Locol’s food is off the damn charts. It was already slaying with its burgers and chicken sandwiches, and now it has just thrown brekkie into the mix. 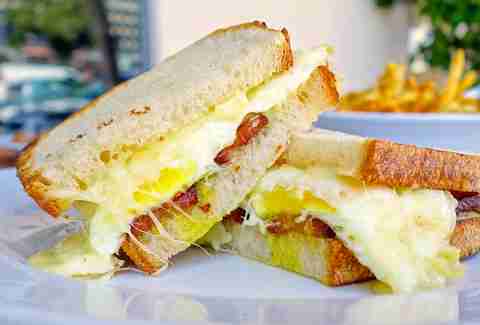 Its egg sandwiches are called “egg in the hole” but actually are sandwich style, and come with a beautiful fast-food style square egg as well as tasty extras like carnitas, machaca, and beans. Oh, and they’re still only $4. Wilder Shaw is a regular Thrillist contributor who doesn’t understand why some restaurants don’t even sell breakfast sandwiches. Explain this phenomenon to him on Twitter at @WilderShaw_ and Instagram at @wildershaw.